CD review: "Sacred Common Ground"
This review first appeared in the Winter and Spring 1996 issue of THE BRIDGE Illustrated. 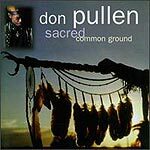 The late Don Pullen was always pushing the boundaries of jazz. Whether playing with Charles Mingus, the avant-garde artist Kip Hanrahan or his own combo, the African Brazilian Connection, Pullen never settled for what would sell to the masses, for what had come before. Right up to the end, when he finally lost his fight against cancer in the spring of 1995, Pullen was pushing, trying new sounds, exploring new territory. "Sacred Common Ground," his last project, was also his most visionary  combining Native American and African traditions into a larger fabric of jazz. It may have been his most difficult, as well. Straight-forward Native American rhythms share little with the multi-layered polyrhyths of Africa and jazz. According to the liner notes by Arnie Malina, Pullen and his band spent months visiting the Kootenai singers before they tried playing together. The singers had to learn to meld their structure to the improvisation of jazz; the jazz musicians had to give the singers space for their own rhythms. But it works  somehow Pullen, leading the whole thing from piano, pulls it off, finding common ground where not only can the Indian and African-American traditions find room to co-exist, but where they can actually support each other, can create a shared space where the musicians can push each other to artistic excellence.